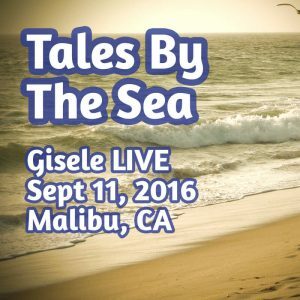 I’m going to be telling a story at one of my favorite story telling shows, Tales by the Sea. If you can make it to the show, you don’t want to miss it! Is about 7 or 8 storytellers, and it take place at such a beautiful place: the Malibu Swim Club. Is a really pretty room directly on the beach, overlooks of the ocean. They also have lot of yummy, homemake soups for everyone. So you come there, you have some yummy soup, you hang out on the beautiful patio overlook to the peaceful ocean. The sun start to set and make its big sunsetting show, and then the storytelling begin. And for me is extra fun because the audience is so nice. Is usually a full-up house, and everybody is really friendly. They laugh a lot, they really friendly. When I’m up in front telling my story, is one of the best feeling in the world for me – to look out at all these friendly faces, and everybody leaning in toward me and riding along for the story what I’m saying. I just love it! And you not gonna believe this part: is all completely FREE. What?!? I know! Completely FREE. The world is full of wonder…. Street parking on Trancas Canyon Road, limited handicapped parking at the Club. Sunday, September 11, doors open 4 pm, refreshments provided.